This tool shows "Roman Numeral" chord analysis of the current Pattern-Track. Simply make sure the cursor in the pattern editor is on the track that you want to analyse, then use the menu entry or shortcut to open the tool. Choose the key that your song is in and you will get an on-screen print out of the chords present in that pattern-track. 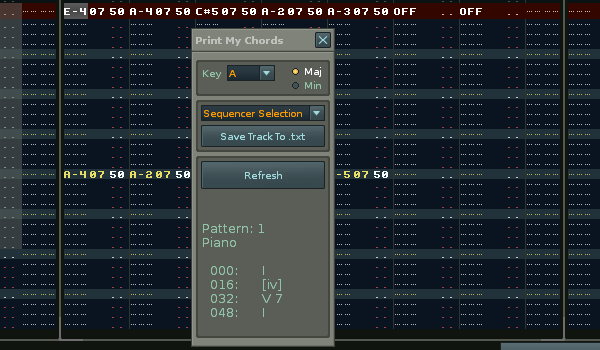 There is also an export feature for the whole-track or selection in sequencer. The resulting text file is best viewed in Wordpad or similar as it contains formatting data. [ ] Square brackets indicate that the chord is not part of the current selected key . e.g. it contains a chromatic alteration. --Changed menu entry under the "tools" menu, to under "Ledger`s scripts"